On the 9th and final day of Navratri we celebrate the form of Durga as Siddhidatri. Siddhi means supernatural power and Datri means giver, so she’s the supreme goddess who fulfills all divine aspirations and provides knowledge to her devotees. Siddhidatri is seated on a lotus and is surrounded by both gods and demons worshipping her, as she is the goddess of all achievements, and the one that destroys ignorance. Siddhidatri is really one of the most glorious forms of Durga. With her grace, all wishes are fulfilled, and as she satisfies our desires, it’s also believed that after worshipping her, no desire will remain in the heart. Legend also says that after worshipping Siddhidatri, Lord Shiva was blessed with all 26 of her Siddhis. 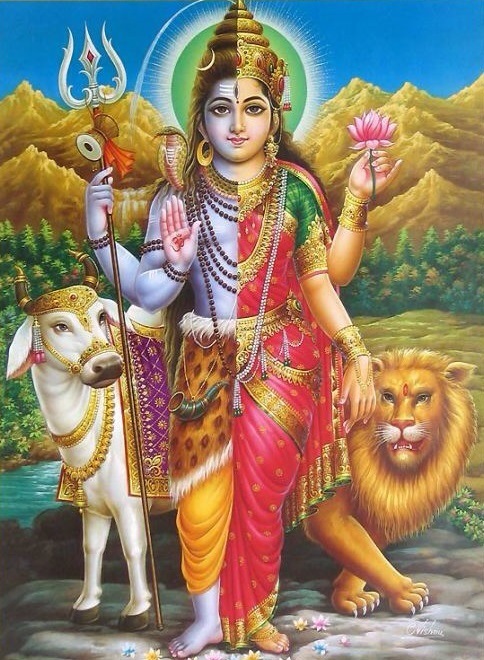 With her blessing, half of Shiva’s body became that of Maa Shakti (female form), and thus he became Ardhnarishwar. Take a few minutes of silence on the final day of Navratri to give thanks and appreciation for all the blessings we are bestowed that live within us and all around us. Let your desired achievements be known, and give thanks for the super powers that you possess. The final devotion to Siddhidatri marks the completion of the Navratri festival! Jai Mata Di! The eighth day of Navratri is called Ashtami and is dedicated to Mahagauri. She is a beautiful form of Durga – equally radiant and compassionate. She’s adorned in pure white clothes, white ornaments and rides a white bull. She is said to have liberated the world from evil forces, and now has the powers of purifying the souls of her devotees and removing all of their sins. She helps improve our knowledge and has a calming effect on us. She is said to be free from the attachments of the material world, and will also help us detach in order to remove suffering from our lives. She will lead us to the path of virtue and inner power. Take a few minutes today to give thanks for the lighter aspects of our lives, for the things that come freely and easily. Then think about your relationships (to people, things, activities, habits) and see if there is anywhere you might be able to detach a bit. 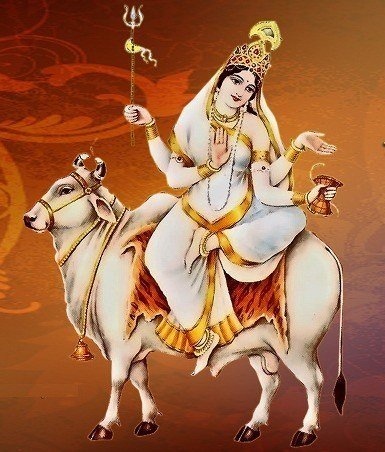 Ask Mahagauri to bless you with her grace in order for you to release and detach more easily in order to create more of what your soul desires. The final three days of Navratri are dedicated to Saraswati, the goddess and grace behind knowledge, creativity and intuition. She lives in the space where creativity and inspiration arise, and she is the power behind us living and speaking our truth. She is the goddess of creativity, more specifically writing and music. She’s the muse that removes our egos when we’re creating and gets us centered in the flow. 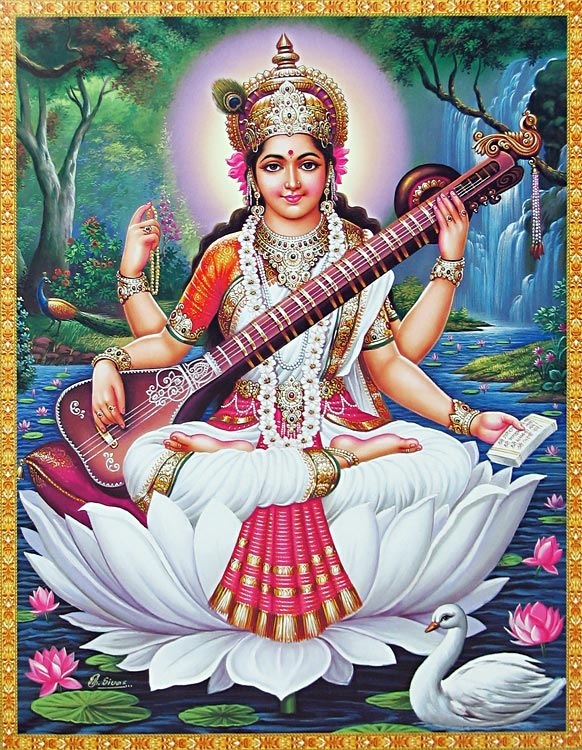 Saraswati is always there to help us find the inspiration and creativity residing inside each one of us, and helps us to listen and trust our intuition. In addition to Saraswati, we also celebrate the fierce aspect Durga today – Kalratri. Although Kalratri depicts the dark side of existence, she is also the power that creates chaos in order to destroy negativity. She removes ignorance and arrogance and brings light into the darkness. She is a source of courage who demolishes evil, eliminates terrors and suffering, and is always there to protect us. She teaches us that destruction is a necessary force that cannot be ignored, and reminds us that the other side of the destruction coin is creation. This knowledge and her grace can help us remain unattached to the material world, and realize the fullness and potential of our being. 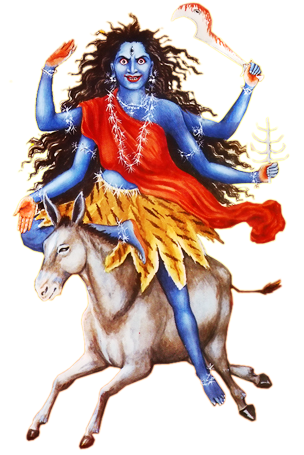 Take a few minutes today to give thanks to Kalratri for her constant protection, and for showing us that destruction is just part of the process of transformation and creation. Ask for her protection and wisdom if you are suffering, fearful, or wondering why it seems that things are falling apart. Remember that with her grace, and the grace that already exists within you, clarity and strength and transformation are yours. On the 6th day of Navratri the goddess Katyayani is celebrated. She is recognized as having 3 eyes and 4 hands. In one hand she is holding a sword, in another she holds a lotus, and in her other two she performs gestures of protection and generous giving. Legend says there was a great sage named Katya who performed extreme penance to have Durga be born his daughter, thus she has the name Katyayani. She is a warrior aspect of Durga and likely Durga’s fiercest avatar, being the one that defeats the great demon Mahishasura. In yoga and tantra traditions she is belongs to the sixth chakra (ajna chakra or third-eye), and can be invoked by concentrating on this point. 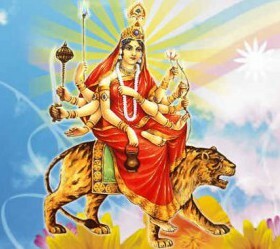 She is a symbol of Shakti (strength), knowledge, victory of good over evil and courage. She inspires devotees to face challenges and perceive the inherent strength within. She is also a goddess of love and can help anyone that desires love and marriage. Although everyday of Navratri is dedicated to a different aspect of Durga, today is the last day of the three dedicated to Lakshmi. As the first three days were dedicated to Durga and her energy of action, the past three days have been dedicated to Lakshmi and her energy of love. So to celebrate this last day of Lakshmi and Katyayani, take a few minutes of silence and focus on your third eye to see the inherent strength and love inside of you. Focus on how this love can expand within you and spread to those around you. Skandamata is the aspect of durga celebrated on the fifth day of Navratri. She is the the mother (mata) of Skanda, who is the brother of Ganesh and also known as Kartikeya. 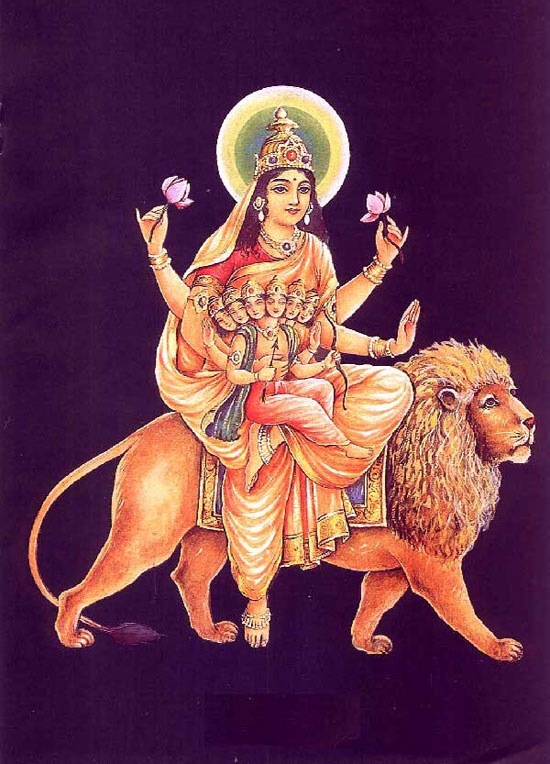 She has four arms, rides a lion, and holds Lord Skanda in her lap. Legend says that after great devotion and many years of penance, Tarkasur, the great demon, was awarded with the boon of being immortal unless killed by one of Shiva’s sons. Thinking that Shiva would never marry or have children the demon thought he had tricked his way into immortality. Not long after he began tormenting the people on earth, Shiva married and had Kartikeya, who defeated the great demon, and restored peace. Skandamata is therefore the great mother, and symbolizes the relationship between mother and son. It is said that anyone that worships her also worships her son and receives both blessings. The one who celebrates her receives love and affection and is blessed with motherly wisdom. Take a few minutes of silence today to give thanks and appreciation for those people in your life that have shown you the way and showered you with love and affection. In your silence recognize your incredible wisdom and ability to fight the challenges in your own life. And above all see the nurturing side of yourself that is encouraging and supportive, and give it a little hug! The next three days of Navratri are dedicated to Lakshmi, the goddess of wealth, material and spiritual prosperity, and beauty. In addition to being the bestower of abundance, she’s also the force that prepares us to receive it by supporting and allowing us to release any fears that may be holding us back. 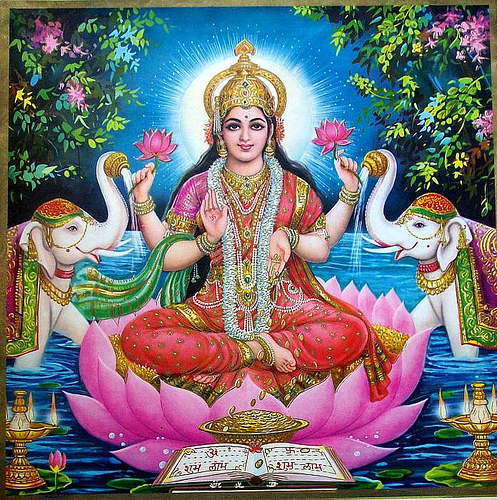 She is the dynamic energy of Lord Vishnu and appears with him in all of his incarnations. She is shown as having four hands representing the four goals of a man’s life: Dharma (righteousness and duty); Artha (Wealth and Prosperity); Kama (Wordly Desires); and Moksha (Salvation). The lotus she sits on represents beauty and consciousness. Her palms are always open sometimes with coins pouring from them signifying she is the giver of wealth and prosperity. 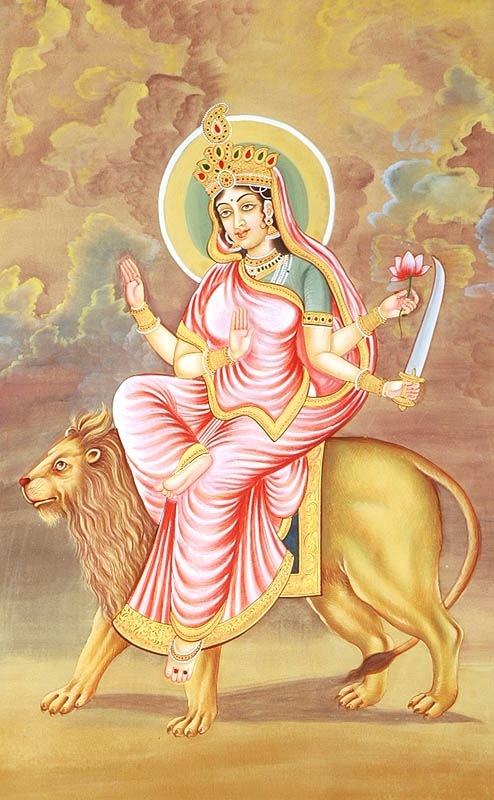 Kushmanda is the face of Durga that is celebrated on the fourth day of Navratri. Her name means “cosmic egg” and she is said to have created the Universe from total darkness with just her smile. She resides in the sun so her radiance and glow matches that of the sun. She’s the one that blesses us with light in the darkest of times, and reminds us that sometimes all it takes to light up the world is a smile. Take a few minutes of silence today to give thanks for the light shining all around us and within us, and know what a difference your smile can make in the world! Chandraghanta is the form of Durga celebrated on Day 3 of Navratri. Chandra meaning moon and Ghanta meaning bell – she is the goddess depicted with a bell-shaped half moon on her forehead. She has three eyes and ten hands carrying her weapons and other instruments, and giving blessings. Although extremely fierce, she is known for bringing blessings of peace, serenity and prosperity. She establishes justice and gives devotees courage and strength to fight their own challenges. Take a minute of silence today and let the energy of Chandraghanta bless you with grace, bravery and courage for whatever challenges you might be facing in your life right now. Then take another minute to give thanks and appreciation to Chandraghanta for the beauty you see in yourself and the world!